Upon arrival at the airport, pickup and transfer to city center by private car and driver. Check in hotel and then free time at your leisure. Overnight at the hotel. 8:30: The tour starts when you meet our English speaking tour guide at your hotel in Hanoi. First of all, we visit Ho Chi Minh Complex which includes Ho Chi Minh Mausoleum, museum, his house on stilt to learn about his life during revolutionary activities in the past. We will pass to One Pillar Pagoda which was built in 1049 by King Ly Thai Tong according to his dream of Bodhisattva seating on a lotus flower and led him to the pagoda. Then we continue to visit Temple of Literature, the first Royal National University in Vietnam built in 1076. Coming there, we have opportunity to learn more about education in Vietnam since 1000 years ago. Around noon: have lunch in local Restaurant with local Vietnamese traditional Cuisines. After that, we continue tour to visit the interesting Museum. There are some options that you can chose such as Museum of Ethnology/Museum of Vietnamese History/Hoa Lo Prison Museum/Military Museum /Women Museum/Art Museum. Both of museum offer informative and well-documented display in our country..
Hoan Kiem Lake and Ngoc Son Temple are the famous sights which we can’t miss to visit in Hanoi. Located in the heart of Hanoi, the lake got its name according to a legend story in the past. 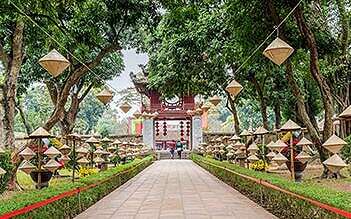 Ngoc Son temple is also one of the most beautiful site in the city center. The temple was established by a mandarin named Nguyen Van Sieu and is dedicated to the spirits of the soil, medicine, literature..
Ninh Binh is an outstanding destination that has many attractions landscapes. Take part in this tour, we have occasion to explore the area by rowboat, and it’s also a perfect occasion for you relax and let your mind wander amongst the diverse limestone features of Van Long nature reserve. 8:00 Our Guide & Car pick up at your hotel. 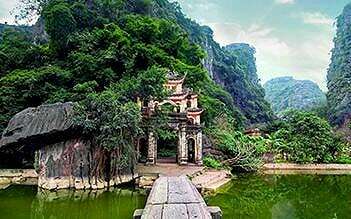 You will leave Hanoi and head north for about 2 hour’s drive to go to Hoa Lu in Ninh Binh, which is known as the Vietnam's Ancient Capital. When we arrive in Hoa Lu after a short break, we will visit the Dinh and Le Temples. 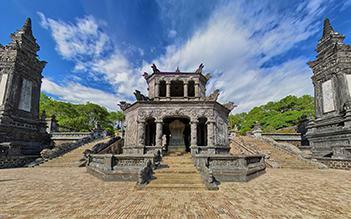 These are two temples dedicated to King Dinh and King Le, the founders of the ancient capital during the 10th century. We start the trip by cycling through the breathtaking rice fields while sightseeing & relax. After that, we enjoy a lunch at a local restaurant with Vietnamese cuisine. On the way back to Hanoi, we continue to visit Van Long Nature Reserve. Van Long Nature Reserve is the largest wetland reserve in the Vietnamese Northern Delta which is situated in Gia Vien district along the Northeastern border of Ninh Binh, Province. Continue getting on the bamboo rowing boat to explore this beautiful natural area, enjoying spectacular scenery surrounded by rice paddies and towering limestone mountain peaks. Along the way you will see caves, green rice fields, Limestone Mountains and the rural life of the locals before returning to Hanoi. Head back to the harbor and take the Car to return to Hanoi. Arrive in central Hanoi, followed by drop-off at your hotel. Tour end at around 18:00. 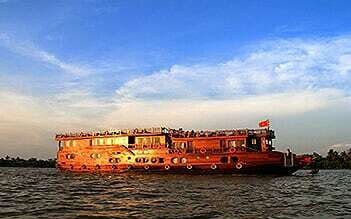 08:00 - 08:30am we will leave Hanoi for Halong Bay – World Natural Heritage site with about 3.5 – 4 hours by drive. Upon arrival to Halong Bay, you will be welcomed by staff on board for cruising and set sail in the bay while lunch is served. Cruising further in the magical bay, you can see thousands of sculpted limestone islands rising from the waves like dragons' teeth on the turquoise waters. In the evening, we will take a bamboo rowboat to discover a water tunnel with many coral reefs in a scenic lagoon. Back on board your cruise, enjoy watching the peaceful sunset and later unwind at a restaurant with dinner served. Stay overnight on board. Wake up on the bay to the sounds of waves and start a new day. You will have an opportunity to view the sunrise over the bay on Sundeck. After breakfast, we will visit a beautiful limestone then go back to the boat for majestic Halong Bay while cruising back to the dock. Driver wait & picks you up at pier then transfer by Car to Hanoi Airport for flight to Da Nang. It will take about 1 hour 20 minutes on flight. Welcomed by our driver in Da Nang Airport then we will be transferred to hotel in Hoi An. Check in, free at leisure the rest of the day and stay overnight at Hoi An Hotel. 08.00 The tour starts when you meet our English speaking tour guide at your hotel in Hoi An. Today we will drive toward My Son Holy Land the foothills of the mountain spine of Indochina. 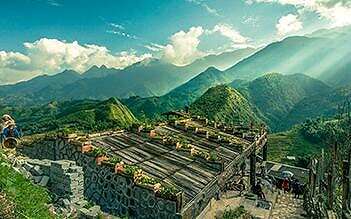 From here we’ll hike into the sacred valley of Vietnam’s most spectacular historic and religious site. Dating back to the fourth century, My Son was the holiest site of the Champa kingdom where over a period of 900 years, 68 significant Hindu temples, most dedicated to Shiva, were built. The towers are built of a combination of perfectly fitted, mortar-less, fired brick and elaborately carved sandstone bas-relief panels. Only 25 survived the centuries of pillaging by Chinese and Khmer invaders as well as U.S. bombings. Leaving My Son and returning to Hoi An. We enjoy lunch at local restaurant in Hoi An. After lunch time, we will take a boat trip on Thu Bon River which is one of the best ways to idle away an hour or two when in Hoi An, and although you can do it the posh way by jumping aboard a tourist boat, it’s far better to go local; and by local I mean grab a sampan. Around 16:00 Return back to your hotel in Hoi An. In the morning, Guide & driver pick you up for tour today. We get transfer for about 3 hours from Hoi An Ancient Town to Hue. Along the way we will stop in the proximity of Da Nang for photo of the “best coastal way” Hai Van Pass, visiting Marble Mountain - named as 5 elements of universe, stone carving village of Hoa Hai or Cham museum for a glimpse into Cham Kingdom once dominated across Indochina. Around noon have lunch in a local restaurant with Vietnamese cuisine. We arrive Hue in the evening. Check in Hotel for relax and rest of day. In the morning, 8:00 we pick you up at your Hotel in Hue. Start tour with a boat for a trip on the Perfume River to visit the Thien Mu Pagoda, one of the most famous Vietnamese site that we must see in Hue. Then we take a short drive into the river where seven tombs were built for seven Nguyen emperors. Each is an expression of the unique personality of the man whose remains it holds and each is comprised of three elements: a temple dedicated to the worship of the deceased emperor and his queen, a stone stele that records the biographical and historical high points of his life, and the royal tomb itself. Today, we will visit two of the tombs of emperors Minh Mang Tomb and Khai Dinh Tomb before driving outside of town for a lunch of classic Hue cuisine at a restaurant in a beautiful garden setting. In the afternoon, we return to the center of Hué. The Kinh Thanh Citadel is the most famous site in Hué. Continue to visit the Forbidden Purple City, originally built in the early 1800s for the personal use of the emperor and staffed by eunuchs who posed no threat to the royal concubines. Free at leisure until being picked up and transferred to Hue Airport by our driver for your flight to Ho Chi Minh City. 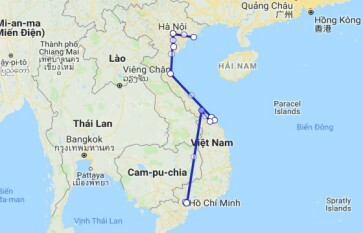 It takes about 1 hour 20 minutes from Hue to the Southern hub Ho Chi Minh City. Upon arrival at Ho Chi Minh City, be welcomed and picked up by our driver to transfer to Ho Chi Minh Hotel. Check in and free at leisure for the rest of the day. Take part in tour, you will visit some typical interesting sights of Ho Chi Minh City such as: War Remnants Museum (or History Museum), Reunification Palace,Saigon Central Post Office,..
Stay overnight at Ho Chi Minh Hotel. 06.00 - 06.30 AM: Pick up at your hotel in Ho Chi Minh city (centrally located). Depart for Cai Be by car/van via Trung Luong Express Highway, stopping to take photos in Tan An town overlooking the picturesque flat rice fields. 09:30 AM: On arrival in Cai Be, set off by motor boat to visit the Cai Be floating market and watch the locals trading fruit and many other commodities on board their vessels. Visit a small family business to see how coconut candy and crispy rice popcorn are made. Then wander into the small villages to visit the orchard and fruit plantation, accompanied by traditional southern Vietnamese folk music. 11:30 AM: Keep cruising through a series of small canals to experience the charms of the Upper Mekong Delta. Arrive in Tan Phong island, the green pearl of Vinh Long town where you can immerse yourself in nature. Enjoy your cooking experience and learn how to prepare special Vietnamese dishes. Food cooked by yourself and fresh river food served in the heart of the garden. Relax on the hammocks to get back your energy. 14:00 PM: Cycle around the village path with fruit orchards and bonsai garden. Meet the local islanders to learn more about the local daily life in the Mekong delta. Free at leisure until time being picked up and get transferred to the airport for your onward flight. Have a smooth departure and hope to see you next time! The tour exceeded my expectations! They took care of us. The tour ran so smoothly and they followed every request and silly question I threw their way. They put us in great hotels and offered us amazing additional tours. Highly recommend!! A massive thank you to Tracy!! Everything was perfectly organised and went like clockwork. Our expectations were exceeded. We discussed multiple changes to our itinerary and all were handled with ease. THANK YOU Asia Package Travel. Would definitely recommend. Everything that Asia Package Travel organised for us was seamless. It was great to be collected from the airport and for daily tours on time and without any hassle or worry. The hotels they chose were good value and in great locations. It was really appreciated that we could customize the tour and add more days etc. Nancy did an excellent job of organizing everything and the upgrades she recommended were very worthwhile. We have already recommended Asia Package Travel to other friends who are travelling to Vietnam and next year. Absolutely loved this package we booked with Asia Package Travel, everything was well organised including airport transfers and good choices of hotels throughout vietnam! i would definitely book through this company again. We booked the package from the North and South of Vietnam and we did the trip end of August. We were a bit sceptical about how this will turned out but we did not had to worry. Asia Package Travel was the agent in Vietnam we were referred to and Deen Hoang was our contact support and organizer. He was always quick to reply to my emails or to reassure me about any concerns. He did such an excellent job in organizing everything and I have nothing to complain. Our trip to Vietnam was well planned and everything went smoothly with no hassles. We were collected from the Airport and for our daily tours always on time without any hassle or worry. They exceeded our expectations. The bus tours were of excellent quality and we really had some wonderful experiences. The hotels we stayed in were good value and in great locations within walking distance to everything. Thank you Deen for making our trip to Vietnam such a wonderful experience. I will definitely come back again and use Asia Package Travel as our organizing agent. We would not hesitate to recommend you to friends who want to visit Vietnam.